In this sequel, I want to actually discuss how I practice this. The last post was lofty; how, then, does what I preach look practically for me? One way is in the example of the beloved disciple resting on Jesus’ chest at the Passover meal. In this scene, and especially in iconography, we have a moment of tenderness and vulnerability. The disciple’s love for and devotion to Jesus is so intense that he cannot help but display it in an intimate and physical. But this love is not entirely selfless; the disciple is looking for reciprocity. In loving Jesus, he too wants to be loved. In leaning on Jesus’ chest, he not only displays love, but asks for it in return. He wants to be held, to be known, to be felt, and to be loved. What was the response to this act? Did the disciples point and laugh at him, calling him names like “sissy” or “homo?” What if Jesus took offense to this, shrugged the disciple off his chest, wailing “Get off me, bro!”? But Jesus does not, and the others do not (though Peter is curious about him in John 21:20-23. Jealous, perhaps?!). Jesus accepts the gesture of love, and in allowing the gesture he reciprocates the love here and on the cross. A transitional aside: We know very little about the disciple whom Jesus loved, and only church tradition identifies him as John the Apostle/Evangelist/Etcetera. However, I’m not even going to begin to explore the identity of the disciple, let alone 1st century CE cultural displays of affection. What matters is what this means to our discussion, and that is that loving Christ transcends gender, and that this love, the kind the beloved disciple shows, directly challenges an over-emphasized masculine identity, or an über-masculinity. 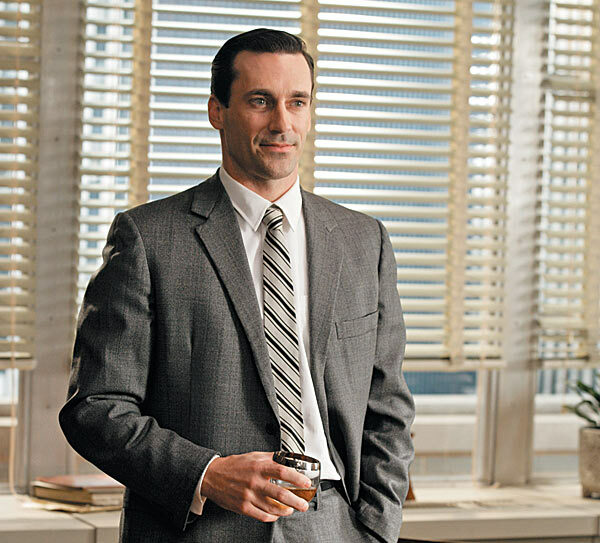 Don Draper of Mad Men: The archetype of uber-masculinity. To love Christ (yikes, this is another whole discussion to be had!) means to love freely, fully, without abandon, and in total humility. The sacrificial love Christ lived out, demonstrated, enacted, and realized is a call to love God and one another. But for the über-masculine male this is difficult, or even impossible. The über-masculine male is an independent and solitary figure. He knows what he wants, knows how to get it, and often times does at whatever cost. He is strong, dominating, ruthless, and triumphant. He is a rock, he is an island, and a rock feels no pain, and an island never cries. How can the über-masculine male love one another, let alone love another man, and that man being Jesus? For the über-masculine male, he cannot! He does not love, but expects others to love him. He lusts and controls, doing whatever to protect his impenetrable masculine identity. He has made himself to be a god, worthy of worship from “lesser forms” of men and women around him. This identity, my beloved, does not belong, and it is an identity that the love of Christ subverts. A man who cannot lay his head upon the chest of Christ, who cannot show love in intimate and personal ways, is a shadow of a true man. However, when one has responded to the love of Christ, a love so powerful, the über-masculine male cannot stand, for his feet of iron and clay are too weak to uphold his identity. Through the selfless and subversive love of Christ, the Son of God, the Son of Man, we find idolatrous identities collapse, and with nothing left of our own to grasp on to, we fall into Christ’s arms, and lay our heads upon his chest. Respond to this post with an example (or examples) of how your worship of God transcends or subverts cultural assumptions of gender identity.